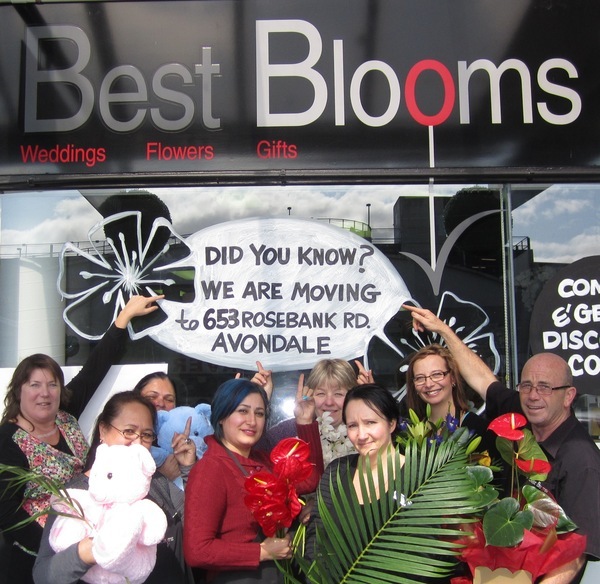 Best Blooms, a local florist business, announces their relocation to 653 Rosebank Road, Avondale, due to its successful internet sales. Currently based in Henderson, the Great North Road location will close Wednesday the 26th of August, 2015. They will be taking phone and internet orders only, for a duration of one month, as they set up their exciting new retail store to open 1 October. The company attributes its growth to a very busy website with over 30,000 online flowers orders, which is a true reflection of the changing habits of customers. More families live further apart, shoppers want the convenience of same day delivery, and with last minute orders placed directly online, there is an increasing demand for a real local florist, who can service their needs across Auckland. According to Philip, the business owner, "In line with a worldwide trend online floral sales have continued to grow for us and the development of our new website means we will continue to invest in this area". With more sales comes more staff, and the need for more space, hence the relocation to busy Rosebank Road. The company chose this convenient location because it has enough parking for both the staff and customers, and great logistics for easy flower deliveries. Although the firm is sad to leave Henderson and its wonderful customers, many of these already order flowers online or by phone, making it easy to book orders, and easily pick them up, particularly as the new store has a very convenient drive in location with parking. The company has evolved over the last 9 years, growing from a small start up business opening the first day of Spring 2006, with just the two owner partners, Jo-Ann Moss and Philip Selwyn, in their small store that was pronounced Winners of the Auckland Top Shop Awards in 2007. Their current location has a team of over 9 staff - who are all West Auckland locals and includes 6 qualified florists, with over 100 years combined experience between them! Jo-Ann Moss, the business owner says, "I remember when we first opened Best Blooms in our little shop in Henderson, our wee boy James, who was 1 year old at the time, was often upstairs in his play pen with my Mum looking after him. Many of our customers still ask after both James and his younger brother, Trent, who was born later, and had a turn at being the Best Blooms baby upstairs. Best Blooms continues to sponsor the weekly "Thanks a Bunch" segment in the Western Leader, and has done for over 6 years. According to Philip Selwyn, the business owner, "We love sponsoring the weekly "Thanks a Bunch" bouquet. The editorial team does a fantastic job of collating the stories of worthy local recipients, and it's been our pleasure to provide over 300 bouquets for them to enjoy as a small reward, and token of appreciation from the local community." The whole team would like to thank all its loyal customers who have stood by them over the past 9 years, it has been a pleasure working together. Best Blooms looks forward to becoming a part of the vibrant Rosebank Road Business Association, and meeting their new customers in their new store, opening on 1st October, 2015. According to Jo-Ann, "It's perfect timing for the new store to open. The Auckland gift show is on at the end of this month, so I will be sourcing new and exciting gifts that are perfect for Christmas, and to include in our online gift baskets. I'm so excited that we finally have parking to offer our customers which will make it so convenient to easily pop in and browse. Best Blooms is a trusted florist business that has been selling flowers to the locals of Auckland, New Zealand since 2006. Started by Philip and Jo-Ann, co-owners of the business, the company has been offering its services online to reach more customers. This has seen it grow significantly over the years.